It’s November. The air has turned chilly. The farmer’s market is closed for the season. I’m no longer craving fresh salsa and garlicky bruschetta. It’s all about soups, baked apples, and bonfires. And with bonfires comes S’mores. It’s a prerequisite. You can’t attend a bonfire and NOT have marshmallows, chocolate and graham crackers. Kids would revolt. The planet would implode. And most importantly, I wouldn’t get my chocolate fix. …oh HELL no, that ain’t gonna happen. But let’s kick up this pyro-loving dessert up a notch. Homemade is where it’s at. 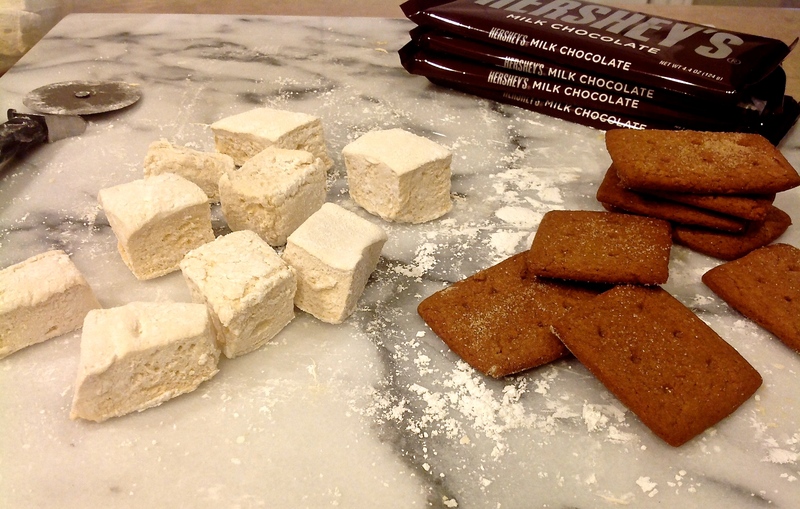 So much yummier (my husband hates that word) than store-bought and people will FUH-REEK OUT over you bringing homemade marshmallows & graham crackers to the party….”Whaaat? That’s even possible?” Yup. Dig in. This might be the best thing you do in a long time. Make the dough: Combine the flours, brown sugar, baking soda, and salt in the bowl of a food processor fitted with the steel blade or in the bowl of an electric mixer fitted with the paddle attachment. Pulse or mix on low to incorporate. Add the butter and pulse on and off several times, or mix on low, until the mixture is the consistency of a coarse meal. In a small bowl, whisk together the honey, milk, and vanilla extract. Add to the flour mixture and pulse a few times or mix on low until the dough barely comes together. It will be very soft and sticky. Lay out a large piece of plastic wrap and dust it lightly with flour, then turn the dough out onto it and pat it into a rectangle about 1-inch thick. Wrap it, then chill it until firm, about 2 hours or overnight. Meanwhile, mix the sugar and cinnamon together in a small bowl for the topping, set aside. Roll out the dough, chill and bake: Divide the dough in half and return one half to the refrigerator. Sift an even layer of flour onto the work surface and roll the dough into a long rectangle about 1/8 inch thick. The dough will be sticky, so flour as necessary. Trim the edges of the rectangle to 4 inches wide then cut into 2-inch squares. Preheat the oven to 350°F. 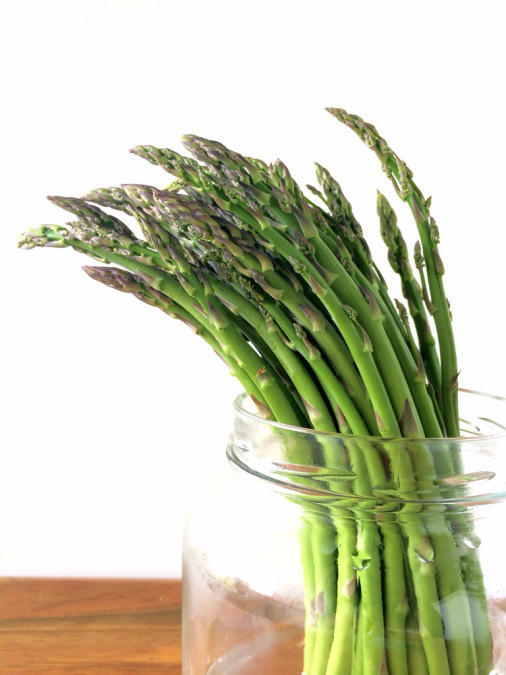 Pull out the chilled squares from the refrigerator or freezer and prick each square 4 – 6 times (2 rows of 2 – 3 pricks) with a toothpick or blunt end of a wooden skewer. 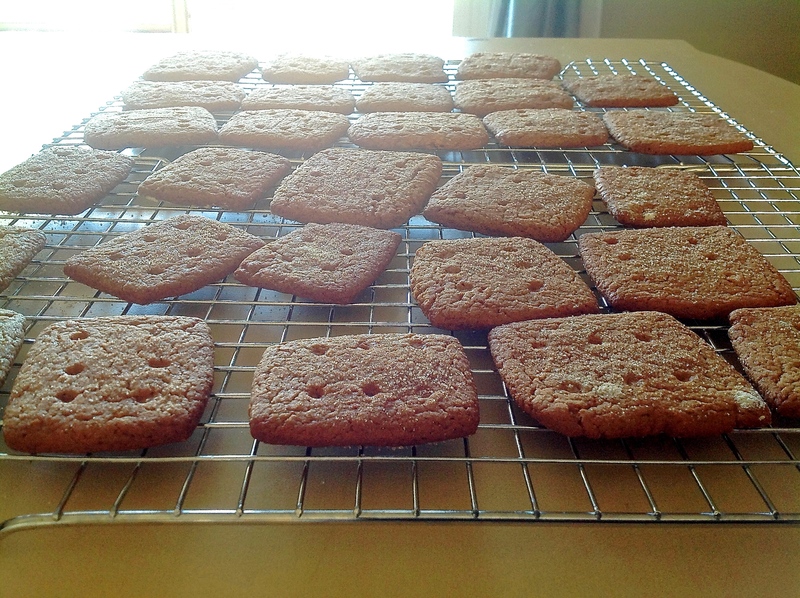 Bake for 15 – 25 minutes, until browned and slightly firm to the touch, rotating sheet halfway through to ensure even baking. Repeat with the second batch of dough, and then gather any scraps together into a ball, chill until firm, re-roll and bake. In bowl of a standing electric mixer or in a large bowl sprinkle gelatin over 1/2 cup cold water, and let stand to soften. In a 3-quart heavy saucepan cook sugars, honey, second 1/2 cup of cold water, and salt over low heat, stirring with a wooden spoon, until sugar is dissolved. Increase heat to moderate and boil mixture, without stirring, until a candy or digital thermometer registers 240°F, about 10 – 15 minutes. Remove pan from heat and pour sugar mixture over gelatin mixture, stirring until gelatin is dissolved. With a standing or hand-held electric mixer beat mixture on high speed until white (or off-white/beige rather), thick, and nearly tripled in volume, about six minutes if using standing mixer or about 10 minutes if using hand-held mixer. In a separate medium bowl with cleaned beaters beat egg whites until they just hold stiff peaks. Beat whites and vanilla into sugar mixture until just combined. Pour mixture into baking pan and don’t worry if you don’t get it all out. Sift 1/4 cup confectioners sugar evenly over top. Chill marshmallow, uncovered, until firm, at least three hours, and up to one day. Run a thin knife around edges of pan and invert pan onto a large cutting board or lift out by loosening marshmallow with fingers on one corner, then transferring to a cutting board. 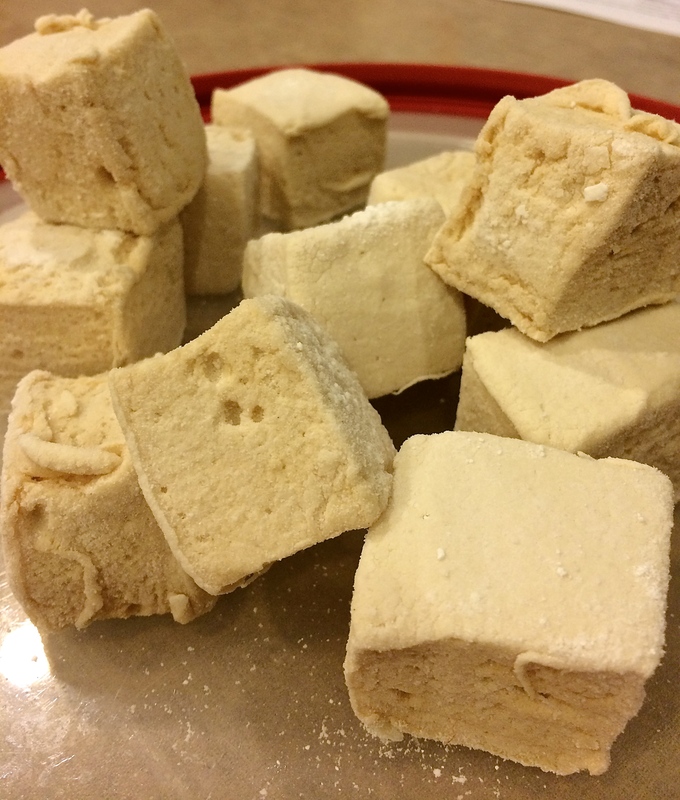 With an oiled pizza cutter or large knife, cut marshmallow into one-inch cubes. Sift remaining confectioners’ sugar into your now-empty baking pan, and roll the marshmallows through it, on all six sides, before shaking off the excess and packing them away. If you didn’t want to use sugar you could use cocoa powder, cinnamon or any combination. Marshmallows keep in an airtight container at cool room temperature for 1 – 2 weeks. Yummers to the max!! These are a must have for every bonfire in the future. You set the bar way high with this one!! !